A Christmas Cookie Exchange is usually planned between friends or relatives. But it can also be planned within a daycare. Have the daycare provider and the parents in the daycare bake some cookies and it works exactly the same way! 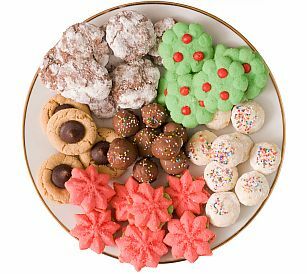 The idea of a Christmas Cookie Exchange is that each person who participates only has to bake one type of cookie, but after the exchange they have a wide variety of cookies for Christmas. It's lots of fun! The first thing that needs to be done is to choose a "host" for the Christmas Cookie Exchange. The easiest person to host the exchange would be the daycare provider herself, but she may not want to if she has to many other things to do for the Christmas season. Send out invitations to the other families and the provider. Supply each family with a list of the Christmas Cookie Exchange Rules. Cookies or Candies must be homemade and freshly baked. No box mixes, bag mixes or preformed dough cookies. No bars please. Please make Christmas cookies rather than an ordinary cookie such as chocolate chip, oatmeal or peanut butter. Everyone should put some effort into making their cookies special for the holiday. R.S.V.P. to the host and let them know which type of cookie you will be making. No duplicate recipes can be used and the first one to announce their cookie recipe gets it. Number of cookies needed will depend on number of participants. We will bake one dozen cookies per participant. Cookies must be packaged by the dozen to easily distribute them to the other participants. Please include a copy of the recipe inside each packaged dozen to share with participants. These rules can be changed and altered to fit your needs. The actual exchange can work a couple of different ways within a daycare. One option would be for everyone to drop their cookies off in the morning when they are dropping their children off. During the day, the provider or the organizer can divide the cookies for each participant. Then at the end of the day when you pick your children up, you also pick up your portion of Christmas cookies. Another option to make the exchange would be to ask everyone to meet on their lunch hour. Of course, this would mean some extra work by the daycare provider because she would have to let you gather at her house. As the host, you can either serve a lunch, order a pizza or ask everyone to bring their own lunch. One more option would be to meet after work and make the exchange. The problem with this plan is that everyone gets off work at different times so it would be difficult to pick a time that works for everyone. As the host of the party, you should be prepared with extra plates and extra ziplock baggies for those participants who did not come prepared! Happy Holidays! I wish you success with your Christmas Cookie Exchange. Have the DaycareAnswers Newsletter delivered right to your inbox!